The number of daily earthquakes increased in July and remained elevated into November. Episodes of volcanic tremor that first occurred in September increased in number, strength, and duration in the past several weeks. On 28 October, residents of Atka observed steam emissions to many hundreds of meters above the summit. On 6 November, the AVO raised the Aviation Level of Concern Color Code to Yellow and the Volcanic Alert Level to Advisory due to the high seismicity and steam emissions. Korovin is a stratovolcano located on Atka Island in the central Aleutian Islands; its most recent reported activity ended in 2007. This report summarizes and contains new information on activity from 1998 to 2007 by drawing on information primarily from the Alaska Volcano Observatory (AVO) and their cited publications. Much of the summary takes the form of a table at the end of the report. Atka volcanic complex. According to Myers and others (2002) Korovin is a part of the 360 km2 Atka volcanic complex, found on the northern part of Atka Island. It is the largest modern complex within the central Aleutians (Myers and others, 2002). The ancestral Atka volcano, in the complex, was described as a large shield volcano consisting of basaltic and basaltic andesite flows, which was subsequently surrounded by a series of satellite vents (Myers and others, 2002). A caldera forming eruption at the Atka shield volcano occurred ~300,000-500,000 years ago, creating a 5-km-diameter caldera. Associated with that event was the eruption of a large dacitic flow, called Big Pink. Regarding the composition of Big Pink, Myers and others (2002) said, "It consists of pumiceous and glassy units but is not associated with any ash flows." After the caldera formation, the volcanic centers of Korovin, Kliuchef, Konia and Sarichef formed. Figure 4 is a topographic map showing the location of these four volcanic centers and the location of the Atka caldera. These structures all comprise the Atka volcanic complex. Figure 4. Topographical map of the northern part of Atka Island, located in the central Aleutian Islands. The map highlights the locations of the Atka caldera, the Korovin, Kliuchef and Sarichef volcanoes and the Konia vent, which all comprise the Atka volcanic complex. Image created by the Alaska Volcano Observatory (AVO) and U.S Geological Survey (USGS) using BigTopo 7 software and AllTopo 7. Image taken from the AVO website. Korovin volcano. Korovin is located 21 km NE from the town of Atka (figure 4). It is the largest and tallest volcano of the post-caldera volcanic centers within the Atka volcanic complex. According to Myers and others (2002), Korovin shows little evidence of glaciation, unlike Kliuchef, located ~5 km S of Korovin. Regarding Korovin' edifice and age, Myers and others (2002) say "Its uneroded form suggests the volcano is mostly Holocene in age." Korovin has a basal diameter of ~7 km and two summit vents located 0.6 km apart (Myers and others, 2002). The NW summit vent has a small crater and is the lower of the two vents. The SE summit has a 1 km wide crater, with steep walls and a depth of several hundred meters (Myers and others, 2002). The SE summit crater sometimes contains a crater lake and is considered Korovin's active crater. Figure 5 is an aerial photo of Korovin, highlighting its two summit vents. Figure 5. Photograph of Korovin volcano taken from an aircraft flying at 9.1 km altitude on 5 August 2007. The view is oblique and from the N (i.e. looking S). Steam is rising from the active crater (SE crater). 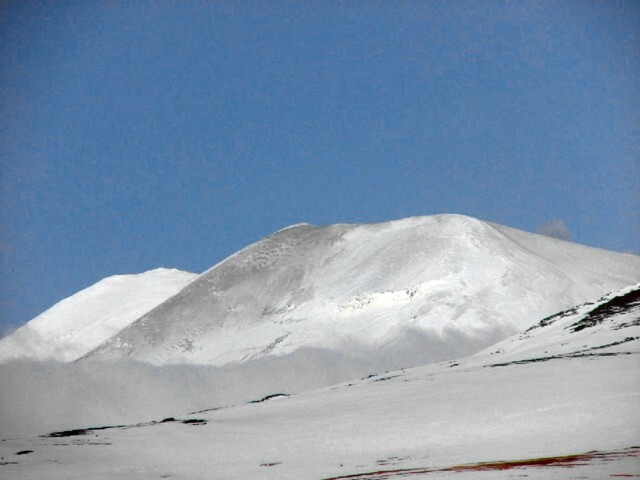 The summit of Kliuchef volcano is partially visible at the top of the image; it sits ~5 km S of Korovin. Photograph taken by Burke Mees, Alaska Airlines. Photograph from McGimsey and others (2011). During the summer of 2004, AVO installed a network of seismic stations throughout the northern part of Atka Island. Data from the network was accessible in March 2005; however, it wasn't until December 2005 that Korovin was considered seismically monitored. On 2 December 2005, Korovin was also officially assigned the Level of Concern Color Code Green after "a sufficient period of background seismicity had been recorded" (McGimsey and others, 2007). Before, AVO had listed Korovin as UA (unassigned) during periods when no significant activity was noted. AVO assigns volcanoes UA when there is no real-time seismic network in the area that can be used to define background levels of seismicity. In addition to being seismically monitored, Korovin is also monitored through ground-based, aerial, and satellite imagery and photographs. Korovin and its plumes are often photographed by residents of Atka village (figures 6 and 7), which are then sent to the AVO. Figure 8 provides examples of photos of Korovin taken from satellites. Images from figures 6-8 furnish various kinds of evidence, from steaming (i.e. 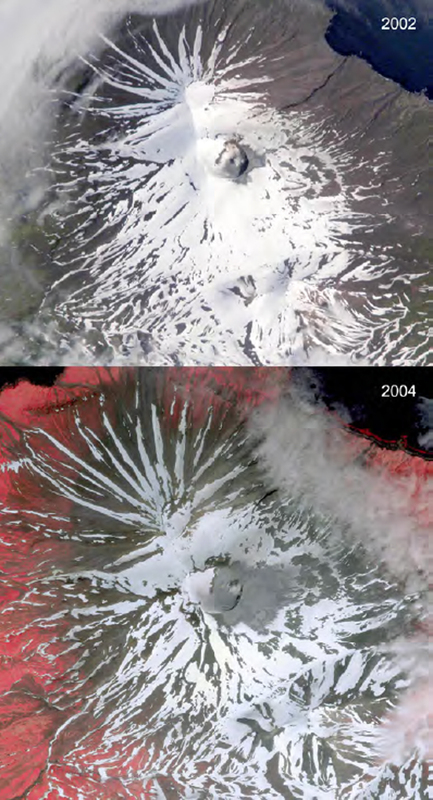 non-eruptive cases, figure 7), ash-bearing plumes (figure 6), and the result of ash-bearing eruptions (ash on the snow surface seen in satellite views, figure 8). Evidence of these kinds is summarized in next section. Figure 6. Photographs showing the progression of a steam plume that developed over Kovorin around 1900 on 23 February 2005. Plume was observed drifting to the E, and ash was seen falling out near the base of the plume. These photos were taken in Atka village and are courtesy of Louis and Kathleen Nevzoroff. Photos were taken from McGimsey and others (2008). Figure 7. Photograph of a steam column rising from Korovin on 27 July 2007. Steam was estimated to reach ~215-245 m above the crater. The photo was captured by Louis Nevzoroff from Atka village. Taken from McGimsey and others (2011). Figure 8. Two satellite photographs showing ash deposits on the upper E flank of Korovin in 2002 (top) and 2004 (bottom). The source of these ash deposits is thought to be intermittent, minor phreatic eruptions through the hot, roiling lake within the SE summit crater of Korovin (McGimsey and others, 2007). Top image was taken on 5 July 2002 and produced by the Image Analysis Laboratory, NASA Johnson Space Center. Bottom image was captured on 4 July 2004 and is an Ikonos near-infrared color composite, copyrighted by Space Imaging LLC. Both images originally published in McGimsey and others (2008). Activity during 1998-2007. During this interval (table 1), activity ranged from eruptive cases to those that were considered non eruptive. Activity was often reported to AVO by Atka village residents and pilots in the area. Korovin was also monitored through satellite imagery, when weather conditions were favorable. During this interval, the highest plumes were observed on 30 June 1998 and reached an altitude of ~9.1 km. As activity varied, the Aviation Color Code (ACC), the Volcanic Activity Alert Level (VAAL), and the Level of Concern Color Code (LCCC) were changed to reflect Korovin's activity status. AVO presented general information on reported activity from 1998-2007 on their website. For each of the events within this interval, AVO cited information from several sources, some of which included the following: McGimsey and others (2003), which discussed activity in 1998; McGimsey and others (2008), which discussed 2005 activity; Neal and others (2009) that looked at 2006 activity; and McGimsey and others (2011) that detailed 2007 activity. AVO also referenced several past Bulletin reports, which highlighted Korovin activity (BGVN 23:06, and 31:02). Our summary in table 1 summarizes the following: (1) the basic information on Korovin's activity from the AVO website and (2) additional information from some of AVO's cited references. Greater detail can be found on AVO's website and in their cited references. Table 1. Condensed descriptions of key events during both eruptive and non-eruptive periods during 1987-2007. The data sources are stated in the table. The Remarks column generally contains the following: (1) "AVO:" This presents a very brief synopsis of the summary that AVO provides on each of their Korovin reported activity web pages (as accessed in May 2015). (2) Below that, we present a succinct timeline of Korovin activity created using on information found in some of AVO's cited references. The 2005 activity is in two sections to highlight different periods of activity during that year; 2006-2007 is considered one period of activity. Where AVO cited references are augmented by past Bulletin reports, the information has been [bracketed]. Times are all local, unless otherwise stated. The term 'resident(s)' refers to resident(s) of Atka village. Abbreviations used are as follows: Village Public Safety Officer, VPSO; above sea level, a.s.l., and Interferometric synthetic aperture radar, InSAR; Aviation Color Code, ACC; Volcanic Activity Alert Level, VAAL; Level of Concern Color Code, LCCC; unassigned activity (UA); and satellite-based Ozone Monitoring Instrument, OMI. "…, the timing of this activity remains poorly constrained; intermittent ash may, in fact, have occurred weeks or prior to June 30." 5 July- Satellite photo of ash deposits on upper E flank of Korovin (figure 8, top). "Intermittent, minor phreatic eruptions through a hot, roiling lake in the south summit crater of Korovin [is] the probable source." 7 July- Korovin photographed with ash covering the snow on its E flank. According to the caption of the photograph, "The deposit may be the result of phreatic explosions or vigorous wind remobilization of ash from within the summit crater." 19 July- Aerial photograph of Korovin showing ash deposited around the crater vent. The caption for the photograph states, "At times, a shallow body of gray, turbid water partially fills the inner crater and, in 2004, was observed roiling. Phreatic explosions from this water-rich, high-temperature system may be responsible for the occasional localized ash-fall deposits seen on the upper flanks of Korovin." AVO: Eruption started, 23 February. Eruption end, 7 May ± 14 days. Considered a questionable eruption. 23 February- Clear day. Residents noted minor steaming around 1200. Around 1900, residents observed dark cloud rising several thousand feet and drifting E (figure 6). Ash seen falling out near base of plume. Minutes later, three or four smaller gray puffs seen. No other activity seen that night. In satellite imagery, small steam plume with minor ash noticed. Height of plume estimated at ~3 km. Early May- Observational data showed roiling lake in SE crater emptied. Visible glow. 13 September- Long sequence of strong seismicity. Sequence began with two small local events, then ~30 minutes of weak tremor, and then ~20 weak local events. Nothing unusual noted in satellite images from this time. AVO: Non-eruptive activity started, 16 January 2006 and ended September 2007 ± 2 months. 19 October- SE crater lake disappeared by this date and absent for rest of 2006. Lake present on 12 September (satellite data). Late November 2006- Significant deformation in latter half of 2006. Circular pattern of uplift, as much as 5 cm noted through July and October InSAR data. November-December- Seismicity high; strong, short-lived signals. Low-frequency tremor bursts. 11 January 2007- M3.5 earthquake considered large for volcano-generated seismicity. References. 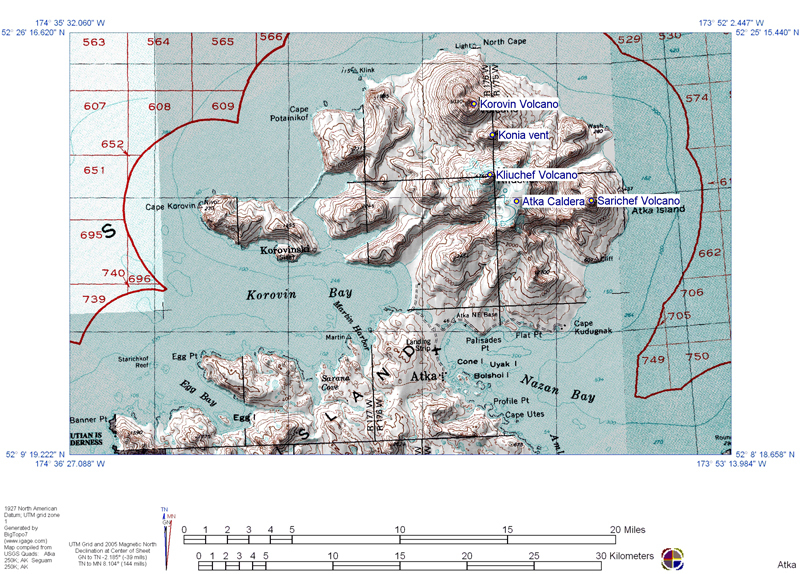 Alaska Volcano Observatory, the U.S. Geological Survey, BigTopo 7, and AllTopo 7, Topographic shaded relief image of the northern part of Atka Island (Image 2906), accessed on 14 April 2005, (URL: http://www.avo.alaska.edu/images/image.php?id=2906). McGimsey, R. G., Neal, C. A., and Girina, O., 2003, 1998 volcanic activity in Alaska and Kamchatka: Summary of events and response of the Alaska Volcano Observatory: U.S. Geological Survey Open-File Report OF 03-0423, 35 pp, (URL: http://pubs.usgs.gov/of/2003/of03-423/). McGimsey, R.G., Neal, C.A., Dixon, J.P., and Ushakov, S., 2008, 2005 Volcanic activity in Alaska, Kamchatka, and the Kurile Islands: Summary of events and response of the Alaska Volcano Observatory: U.S. Geological Survey Scientific Investigations Report 2007-5269, 94 pp, (URL: http://pubs.usgs.gov/sir/2007/5269/). McGimsey, R.G., Neal, C.A., Dixon, J.P., Malik, N., and Chibisova, M., 2011, 2007 Volcanic activity in Alaska, Kamchatka, and the Kurile Islands: Summary of events and response of the Alaska Volcano Observatory: U.S. Geological Survey Scientific Investigations Report 2010-5242, 110 pp, (URL: http://pubs.usgs.gov/sir/2010/5242/). Myers, J.D., Marsh, B. D., Frost, C. D. and Linton, J.A., 2002, Petrologic constraints on the spatial distribution of crustal magma chambers, Atka Volcanic Center, central Aleutian arc, Contributions to Mineralogy and Petrology, vol. 143, issue 5, pp. 567-586, DOI 10.1007/s00410-002-0356-7 (URL: http://link.springer.com/article/10.1007/s00410-002-0356-7). Neal, C.A., McGimsey, R.G., Dixon, J.P., Manevich, A., and Rybin, A., 2009, 2006 Volcanic activity in Alaska, Kamchatka, and the Kurile Islands: Summary of events and response of the Alaska Volcano Observatory: U.S. Geological Survey Scientific Investigations Report 2008-5214, 102 pp, (URL: http://pubs.usgs.gov/sir/2008/5214/). Information Contacts: Alaska Volcano Observatory (AVO), a cooperative program of a) U.S. Geological Survey, 4200 University Drive, Anchorage, AK 99508-4667, USA (URL: http://www.avo.alaska.edu/), b) Geophysical Institute, University of Alaska, PO Box 757320, Fairbanks, AK 99775-7320, USA, and c) Alaska Division of Geological & Geophysical Surveys, 794 University Ave., Suite 200, Fairbanks, AK 99709, USA; Game McGimsey, AVO. AVO decreased the Concern Color Code at Korovin from Yellow to Green (the lowest level) on 8 March. After raising the Concern Color Code on 22 February in response to increased seismicity, the rate of micro-earthquakes stabilized and then declined. During 1-8 March, seismicity was near background levels and no unusual activity was seen on satellite imagery or by observers. Seismicity at Korovin remained slightly above background levels during 24 February to 3 March. Clouds obscured satellite views of the volcano, and AVO received no reports of activity. There were no indications that an eruption was imminent. The volcano remained at Concern Color Code Yellow. AVO reported that the Concern Color Code at Korovin volcano was raised from Green to Yellow on 22 February due to an increase in seismicity at the volcano. Distinct seismic signals indicating unrest were recorded on 4 days between 17 and 22 January, with a sustained 11-minute-long seismic signal on 22 February. After 22 February, seismicity decreased and distinct seismic signals like those recorded earlier were not detected. Clouds obscured satellite views of the volcano after 22 February. A pilot report on the 22nd indicated that the summit area was obscured by clouds, and there were no signs of ashfall on the flanks and no steam plume above the volcano. No obvious signs of activity were seen on 23 February by observers in the village of Atka. AVO received no reports of volcanic activity and there were no indications that an eruption was imminent. AVO did not receive reports of activity at Korovin volcano after the original report of ash-and-steam emissions on 24 February. During 25 February to 4 March, cloud cover prohibited satellite views of the volcano and no unusual seismicity was registered. Korovin is not monitored by a standard AVO seismic network. Therefore, AVO did not assign a Concern Color Code to the volcano during the report period. On 24 February AVO raised the Concern Color Code at Korovin volcano from Green to Yellow after receiving a report that ash and steam were emitted from Korovin on 23 February around 1900. According to residents of Atka village near the volcano, the initial ash burst rose to a height of ~ 2.4 km a.s.l. and drifted E. It was followed by several smaller ash-and-steam bursts. No ashfall was reported in Atka village, nor were there reports of accompanying volcanic odors, earthquakes, or larger volcanic explosions. Satellite images of the volcano did not clearly show the presence of ash or any thermal anomalies. On the morning of 24 February the volcano was steaming. AVO warned that low-level steam-and-ash emissions may continue and could pose a hazard to people and low- to medium-flying aircraft in the vicinity of the volcano. They further warned that if the eruption continues and begins to intensify, light ash fall could occur on parts of Atka Island, including the village of Atka. [On 6 May], James Dickson noted a 500-m vertical steam plume over the SE part of the summit [of Korovin]. 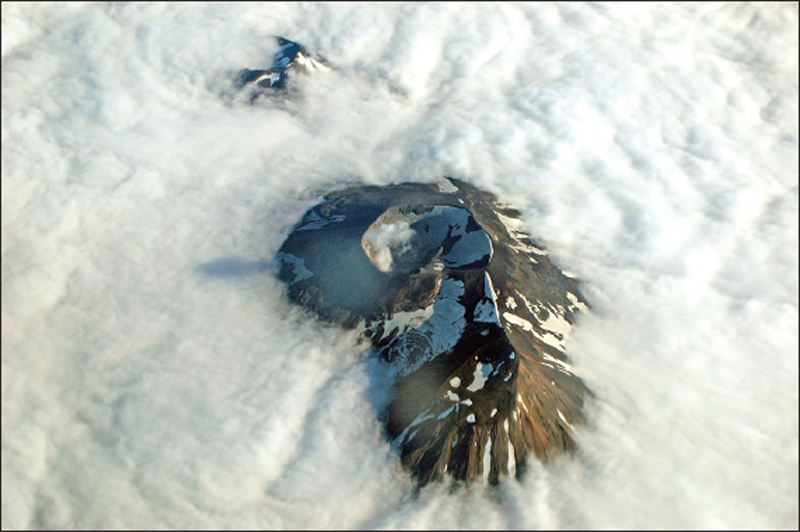 On 23 May at about 1730, Aleutian Air pilot Thomas Madsen noted a 600-m steam plume containing traces of ash rising above the rim of a 240-m-deep crater in the SE part of the summit area. A shallow magnitude 7.7 earthquake centered roughly 100 km [SSW] of Korovin at [51.52°N, 174.78°W] occurred 7 May [at 2247 GMT]. John Reeder and Kirk Swanson climbed [Korovin] in July 1983, observing only minor steaming from deep within the crater, rising to only 60 m above its floor. Information Contacts: J. Reeder, ADGGS; T. Miller and M.E. Yount, USGS Branch of Alaskan Geology, Anchorage. On 18 March at 1954 a NOAA 10 satellite image showed three distinct plumes, each 95 km long, drifting ENE. The estimated vent locations were: 52.38°N, 174.15°W (Korovin's summit); 52.31°N, 174.24°W; and 52.29°N, 174.21°W (5.5 km WSW and 6.5 km SW of Mt. Kliuchef, a cone on Korovin's S flank). More accurate locations will be determined by USGS Anchorage. Just before midnight on the same day US Navy pilot Jeffrey Sullivan observed a southward-drifting ash plume rising to at least 3,000 m altitude, lit by an orange "flame" from Korovin. Smaller orange flickering "flames" from two other vents at lower elevation were visible. Two of the vents were ~2 km apart and the third vent was ~10 km NE of the other two vents. Earlier in the day (at 1300) Julie Dirks and other Atka residents noticed sulfur smells (~18 km from the volcano). Although the weather was clear Dirks did not notice any "unusual" eruptive activity. On 19 March a SIGMET notice was issued to warn pilots of volcanic ash 185 km on either side of a line from 52°N, 175°W to 54°N, 172°W. The warning remained in effect until 0930. Pilots reported that the ash cloud reached 3,600 m.
Information Contacts: J. Reeder, ADGGS; M. Matson, NOAA/NESDIS; T. Miller, USGS, Anchorage. 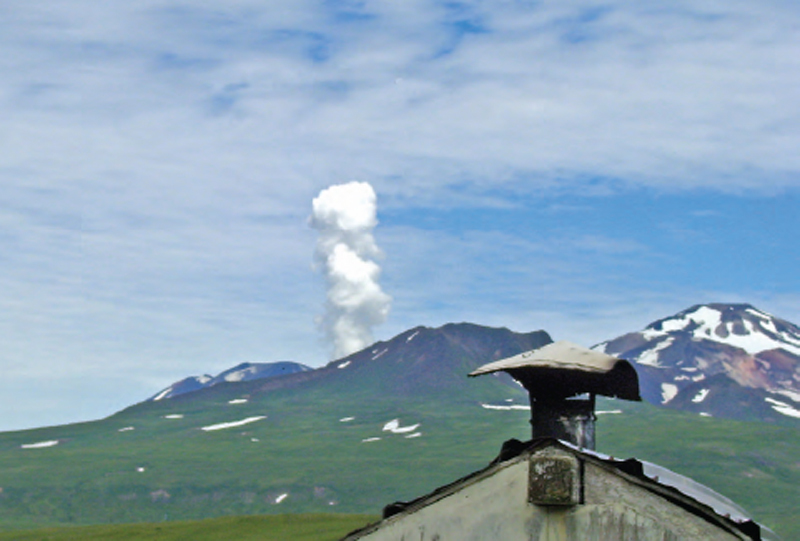 At about 1000 on 30 June, the Alaska Volcano Observatory (AVO) received a report of an eruption at Korovin from an observer in the village of Atka, near the volcano. The crew of a Coast Guard C-130 airplane confirmed that a low-level eruption plume had risen to almost 5 km above sea level by 1030, and late in the afternoon a pilot reported the plume at 9 km. The low-level ash-and-steam plume was not visible on satellite imagery due to meteorological clouds. Local winds at the time were light and to the SSW. A dusting of ash was reported in Atka. Poor weather on 1 July prohibited both direct and satellite observations. 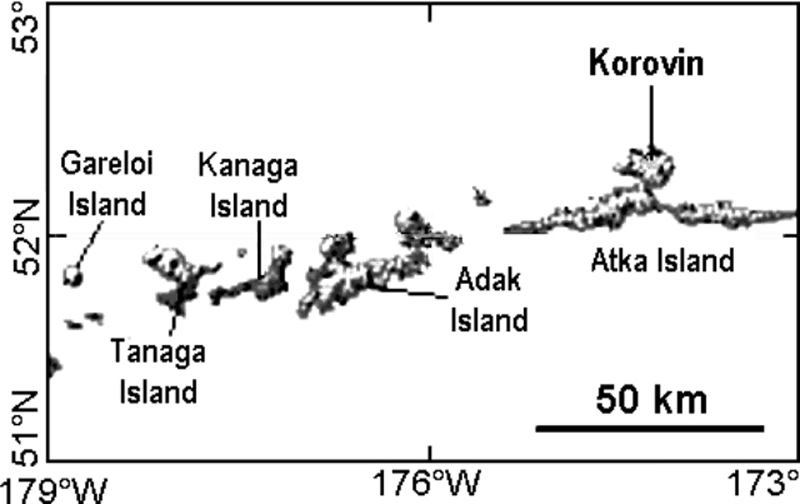 Korovin volcano is located on the north end of Atka Island in the central Aleutians (figure 1), 538 km W of Dutch Harbor. It is 21 km N of the village of Atka, which has a population of about 100. The last reported eruption was in March 1987. AVO does not maintain seismic monitoring equipment on Atka Island. Figure 1. 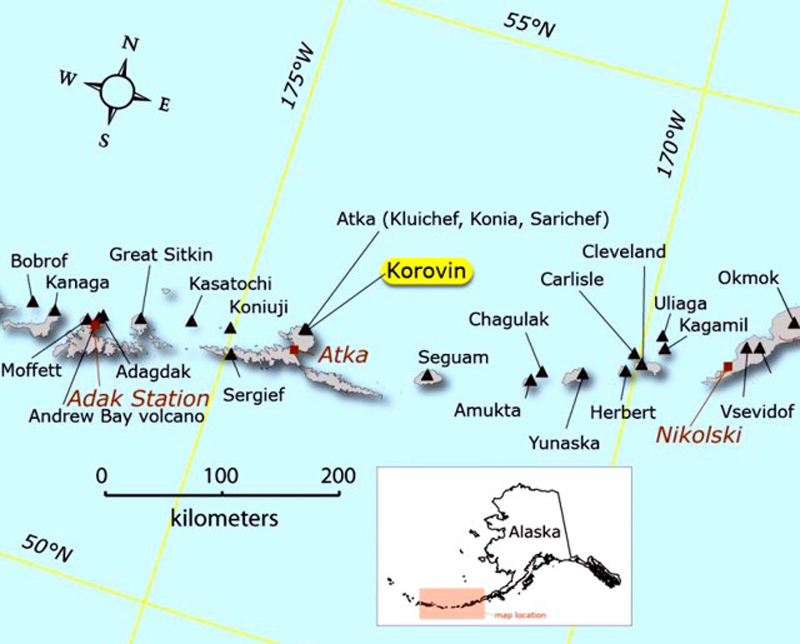 Location of Korovin [Atka] volcano in the Aleutians. Map courtesy of AVO. 2005 activity. The Alaska Volcano Observatory (AVO) received a report that a sudden minor steam-and-ash eruption occurred at Korovin around 1900 on 23 February . Korovin is an active volcano ... in the central Aleutian islands, ~ 184 km E of Adak island and ~ 600 km W of Unimak island, and 1,760 km SW of Anchorage. According to residents of Atka village near Korovin, the initial ash burst rose to an altitude of ~ 2.4 km and drifted E. It was followed by several smaller ash-and-steam bursts. No ashfall was reported in Atka village, nor were there reports of accompanying volcanic odors, earthquakes, or larger volcanic explosions. Satellite images of the volcano did not clearly show the presence of ash or any thermal anomalies. But, on the morning of 24 February  (the morning after the eruption) the volcano was still steaming with some vigor. During the period 25 February-4 March , cloud cover prohibited satellite views of the volcano, and no unusual seismicity registered. Although Korovin was not monitored by a standard AVO seismic network, Atka village hosts a seismic station operated by the Alaska Earthquake Information Center. [No activity was reported following the 23 February 2005 eruption until January 2006]. 2006 activity. Distinct seismic signals indicating unrest were recorded on 17, 18, and 21 January 2006, and 21 and 22 February 2006. The latter day (22nd) brought an unusually sustained, 11-minute-long signal. After 22 February 2006, seismicity decreased and distinct seismic signals like those recorded earlier were not detected. An 8 March report noted that Korovin's rate of occurrence of micro-earthquakes had stabilized and then declined, and "it has been close to background levels for the past week." For some days after 22 February, clouds obscured satellite views of the volcano. However, on the 22nd an aviator reported that, although the summit area was obscured by clouds, no signs of ashfall on the flanks or any steam plume was seen. On 23 February, observers in the village of Atka noted the lack of obvious signs of activity. AVO received no short-term reports of precursory volcanism to indicate an imminent eruption. Seismicity at Korovin remained slightly above background levels during 24 February to 3 March 2006. Clouds continued to mask satellite views of the volcano, and AVO received no further reports of activity. 2005 activity. Korovin... has been relatively quiet since 23 February , when it emitted minor though abruptly discharged steam and ash (BGVN 31:02). At that time, an initial ash burst rose to an altitude of ~ 2.4 km and was followed by several smaller ash-and-steam bursts, but no ashfall was reported in Atka village (figure 2). There were no reports of accompanying volcanic odors, earthquakes, or larger volcanic explosions. Early 2006 activity. Earlier this year, seismicity indicating unrest was noted in January and February (BGVN 31:02). From 24 February-3 March 2006, seismicity at Korovin was slightly above background levels. During that time frame, the Alaska Volcano Observatory (AVO) raised the concern color code at Korovin from Green to Yellow. The concern color code was then but reduced it to Green on 8 March 2006 . Figure 2. Sketch map of the central Aleutian Islands including Atka Island and the city of Atka (population 27, according to 1999 US Census estimate). Courtesy of USGS/AVO. Late 2006 activity. An increase in seismicity during July 2006 represented a transition from prior low activity, meanwhile volcanic activity remained mild during that time (figure 3). Figure 3. 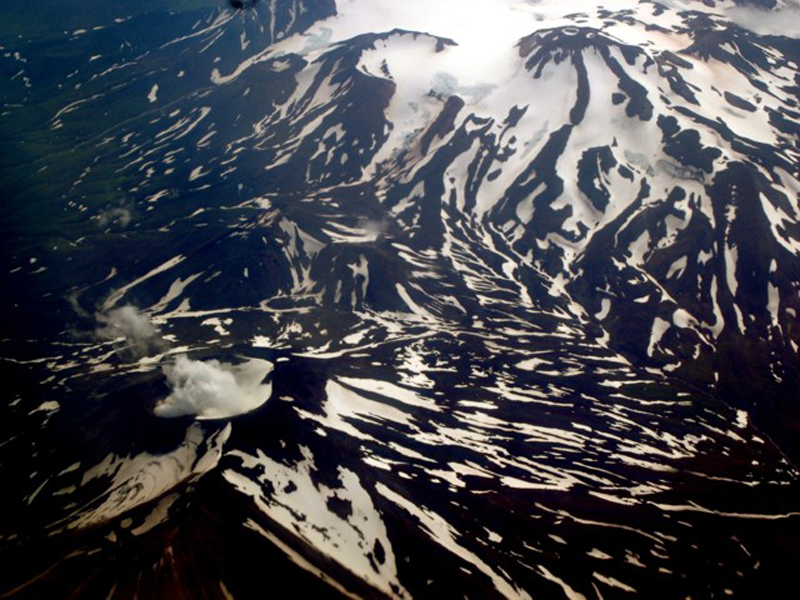 The Korovin cone (lower left) in the Atka volcanic center was puffing steam to ~ 300 m above the summit on 30 July 2006 when seen from an Alaska Airlines jet. 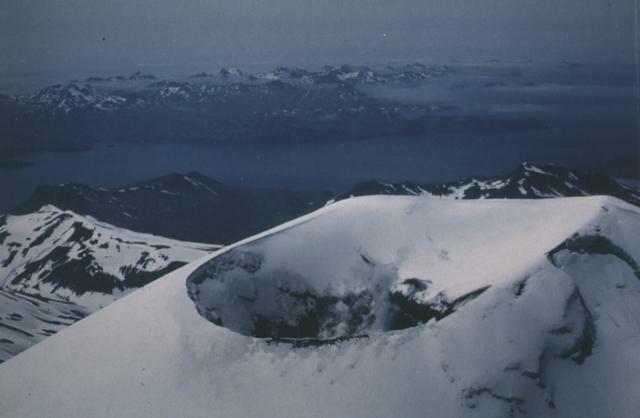 The Kliuchef cone (upper right, with two snow-clad craters) is one of multiple satellite cones. Photo credit to Cyrus Read; image courtesy of AVO/USGS. This report also covers further minor events during September through December. During September and October, episodes of volcanic tremor increased in number, strength, and duration. On 28 October, residents of Atka village observed and photographed steam emissions to several hundred meters above the volcano. For the duration of November and December, seismic levels remained above background levels. In late November satellite information showed a light dusting of ash on the E flank of the main crater along with several plumes and/or their shadows visible along the N side of the crater. Satellite radar images indicated uplift of the volcano; the area of uplift was consistent with locations of earthquake activity and the effects were interpreted as the result of magma injection. Cloud cover permitted only erratic satellite observation during November and December. On 11 and 21 December 2006, Atka residents again witnessed steam plumes, on the latter date possibly containing ash. 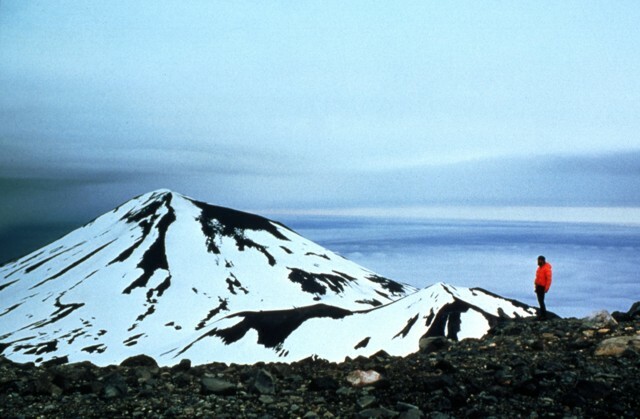 Korovin, the most frequently active volcano of the large volcanic complex at the NE tip of Atka Island, contains a 1533-m-high double summit with two craters located along a NW-SE line. The NW summit has a small crater, but the 1-km-wide crater of the SE cone has an unusual, open cylindrical vent of widely variable depth that sometimes contains a crater lake or a high magma column. 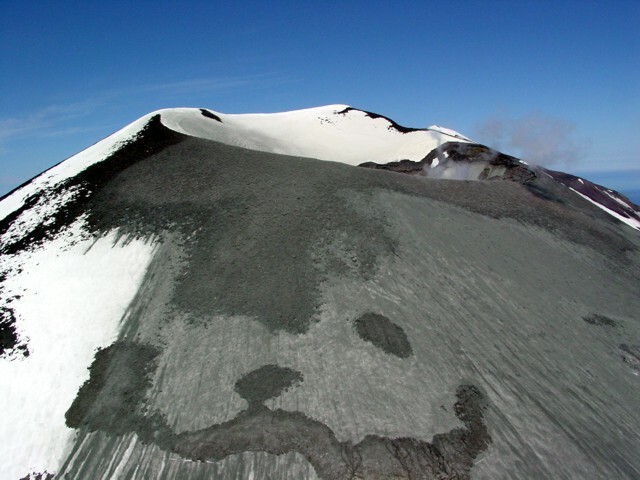 A fresh-looking cinder cone lies on the flank of partially dissected Konia volcano, located on the SE flank. The volcano is dominantly basaltic in composition, although some late-stage dacitic lava flows are present on both Korovin and Konia. Myers J D, March B D, Sinha A K, 1985. Strontium isotopic and selected trace element variations between two Aleutian volcanic centers (Adak and Atka): implications for the development of arc volcanic plumbing systems. Contr Mineral Petr, 91: 221-234. Myers J D, Marsh B D, Frost C D, Linton J A, 2002. Petrologic constraints on the spatial distribution of crustal magma chambers, Atka volcanic center, central Aleutian arc. Contr Mineral Petr, 143: 567-586. There is no Deformation History data available for Korovin. There is no Emissions History data available for Korovin. The 200 cu km Atka volcanic complex at the NE tip of Atka Island is the largest volcanic center in the central Aleutians. A central shield volcano and caldera is ringed by 7 or 8 satellitic volcanoes. 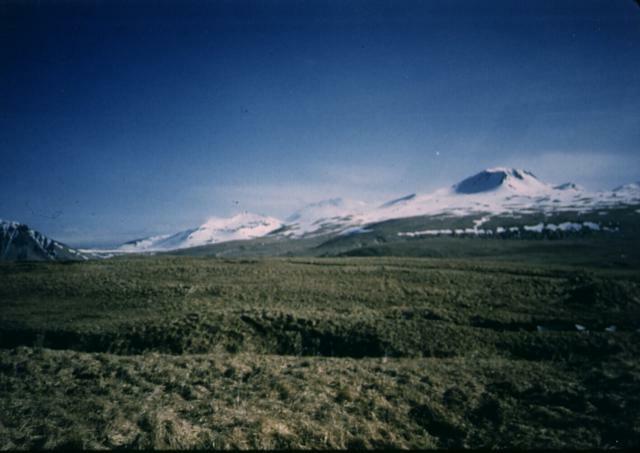 This view, from the south near Atka village, shows 1533-m-high Korovin volcano, the highest and northernmost of three Holocene stratovolcanoes of the Atka volcanic complex. Korovin has been the most active during historical time, but Sarichef and Kliuchef volcanoes may also have had historical eruptions. Photo by James Dickson, 1986 (courtesy of John Reeder, Alaska Div. Geology Geophysical Surveys). An unusually clear view from the NE in June 1986 shows steam rising from the summit crater of Korovin volcano, north of the Atka volcanic center. Korovin has been reported to have an unusual, open cylindrical vent of greatly variable depth. Pilots overflying the crater have reported that it sometimes contains a crater lake and at other times a high magma column. Photo by Harold Wilson (Peninsula Airways), 1986 (courtesy of John Reeder, Alaska Div. Geology & Geophysical Surveys). 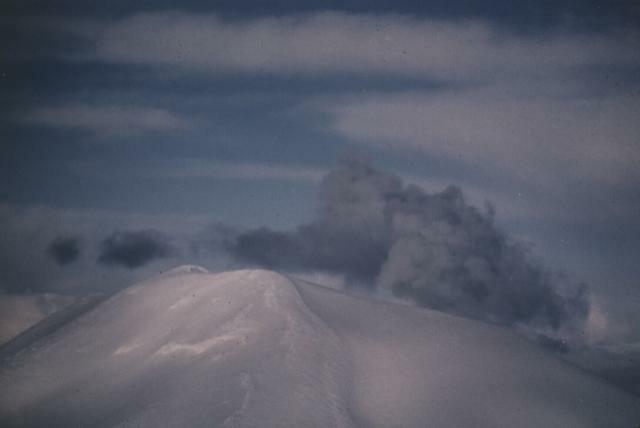 A steam plume, possibly containing minor amounts of ash, rises above the summit of Korovin volcano on March 4, 1987. This view of Korovin, north of the Atka volcanic center, was taken from the south. A satellite image on March 18 showed 3 distinct plumes, originating from Korovin and 2 vents to the south, that extended 95 km to the south. Pilots observed ash clouds and "flames" from Korovin and two vents that appeared to be on the SW flank of Kliuchev volcano. Photo by Harold Wilson (Peninsula Airways), 1987 (courtesy of John Reeder, Alaska Div. Geology Geophysical Surveys). Korovin is seen from the south, with the satellitic cone of Konia on its SE flank to the left of the person at the right. Korovin is the most frequently active volcano of the large volcanic complex at the NE tip of Atka Island, and contains a double summit with two craters located along a NW-SE line. The NW summit has a small crater, but the 1-km-wide crater of the SE cone has an unusual, open cylindrical vent of widely variable depth that sometimes contains a crater lake or a high magma column. Photo by Jim Myers, 1997 (University of Wyoming; courtesy of Alaska Volcano Observatory). A satellite image on July 4, 2004 showed fresh ash deposits on the upper east flank of Korovin, probably from minor phreatic eruptions through a hot, roiling lake in the south summit crater of Korovin. This photo, taken from the SE, show debris mantling the upper slopes of Korovin's SE crater. Photo by Game McGimsey, 2004 (Alaska Volcano Observatory, U.S. Geological Survey). A telephoto view on March 3, 2007 shows a light-gray layer ash covering the west flank of Korovin volcano. In late November, 2006, satellite information showed a light dusting of ash on the E flank of the main crater along with several plumes and/or their shadows visible along the N side of the crater. On December 11 and 21, 2006, Atka residents again witnessed steam plumes, on the latter date possibly containing ash. Photo by Kerry Moore, 2007 (courtesy of Alaska Volcano Observatory). There are no samples for Korovin in the Smithsonian's NMNH Department of Mineral Sciences Rock and Ore collection. Large Eruptions of Korovin Information about large Quaternary eruptions (VEI >= 4) is cataloged in the Large Magnitude Explosive Volcanic Eruptions (LaMEVE) database of the Volcano Global Risk Identification and Analysis Project (VOGRIPA).